Herpes simplex virus type 1 (HSV-1) is one of the most prevalent human viruses, with around a 70% infection rate in the human population. HSV-1 replication usually leads to cold scores as the most common disease form. Rarely, more severe diseases are associated with HSV-1, such as infection-associated blindness and encephalitis, which can be life-threatening. HSV-1 has also been genetically modified to function as an oncolytic virus to fight cancer due to its strong immune-stimulatory effect and the first FDA approved oncolytic viral therapy is based on HSV-1. HSV-1 infection stimulates antiviral immunity, the extent of which determines the pathologic or oncolytic effect of the infection. The continuous arms race between host and HSV-1 shapes host immunity and understanding it is very beneficial for the development of better antiviral and anti-cancer therapy. In our recent study entitled “Species-Specific Deamidation of cGAS by Herpes Simplex Virus UL37 Protein Facilitates Viral Replication,” published in the journal Cell Host & Microbe, we revealed how HSV-1 uses an intricate strategy to combat host immunity to facilitate its replication. Moreover, our study partly answers a question: why human beings (and mice) are susceptible to HSV-1 infection, while most other species are relatively resistant to HSV-1. The genetic information of HSV-1 is carried in its DNA genome, similar to the human genome. When our cells are infected by HSV-1, viral DNA released in the cytoplasm is detected by a cytosolic DNA sensor protein named Cyclic GMP-AMP synthase (cGAS). cGAS then activates downstream antiviral responses to restrict viral DNA replication. A series of studies indicate that cGAS plays a pivotal role to restrict HSV-1 replication. For instance, studies from our group and others demonstrate that mice that are genetically-deficient of cGAS all succumb to HSV-1 infection while most normal mice can survive HSV-1 challenges. Since cGAS potently suppresses HSV-1 replication, HSV-1 needs to counteract cGAS to efficiently replicate in human cells. Our study identified an intricate mechanism that HSV-1 employs to inactivate cGAS. During HSV-1 infection, a bunch of viral proteins are expressed in the infected cells. Among these viral proteins, a specific viral protein named UL37 modifies cGAS through a post-translational medication called deamidation, meaning that several amino acids of human cGAS are changed to a different set of amino acids by this kind of modification. These changes block the function of cGAS and cGAS cannot function properly to suppress HSV-1 replication. One of the amino acids in human cGAS that is modified during HSV-1 infection is an Asparagine. It is known that cGAS is a very conserved protein existed in different species; when we compared cGAS from other species we found that the asparagine was conserved among human, mice, and gorilla, while it is a different set of amino acids (Histidine or arginine ) in other non-human primates. This raises an intriguing hypothesis that this different site may be critical to determine the species-specific permissiveness of HSV-1. Furthermore, antiviral proteins such as cGAS usually undergo strong positive selection during evolution. Our evolutionary analysis and analysis from other groups all showed that this specific site is indeed under positive selection. More importantly, when we intentionally mutate Asparagine in human cGAS into Histidine or Arginine that mimic cGAS from non-human primates, those cells expressing the mutant cGAS can induce stronger antiviral immune responses and are more resistant to HSV-1 infection. In contrary, if we mutate Histidine or Arginine of cGASs from the Black Mangabey or Orangutan (two different non-human primates) into Asparagine, the cells expressing the mutant monkey cGASs with asparagine can be deamidated by HSV-1 and are more sensitive to HSV-1 infection. These findings indicate that HSV-1 has exploited specifies difference of cGAS to facilitate its replication in some species, including human and mice. In other words, cGAS expressed in our cells are vulnerable to HSV-1 attack, which explains why human beings are susceptible to HSV-1 infection. Moreover, this study also has potential implications for the therapeutic use of HSV-1. The deamidation activity-deficient mutant of HSV-1 induces strong immune responses and has dramatically reduced pathology, making it a potential candidate for the development of a vaccine for antiviral purpose and oncolytic viral therapy for cancer treatment. These findings are described in the article entitled Species-Specific Deamidation of cGAS by Herpes Simplex Virus UL37 Protein Facilitates Viral Replication, recently published in the journal Cell Host & Microbe. This work was conducted by a team including Junjie Zhang, Jae Jung and Pinghui Feng from the University of Southern California, and Alex Stabell and Sara Sawyer from the University of Colorado Boulder. 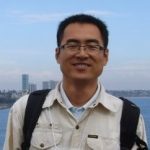 Junjie is a research associate at the University of Southern California.